Hi Everyone! Thanks for your interest in my organization :). My friends and I have had so much fun working together over the past two years, volunteering in our community. We hope you will join us!! Please check back often. I will be updating this list and adding new dates. So many times volunteer opportunities come up at the last minute. We are also meeting with RHS advisors next week to see how we may coordinate our efforts with other RHS service clubs. I know we all have hectic schedules with school, sports and activities, but I hope you’ll be able to make even a few of the events this year. For each opportunity below, please RSVP to info@rayshope.org or text 330.714.8898, so that we can make sure we have enough materials and my mom can coordinate rides, if needed. We’ll be making crafts to sell at the RHS Craft Show on Nov. 10th. 100% of sales will benefit Roosevelt and Stanton students. School nurses do their best to make personal hygiene items available to all students in need, but they rely on donations. We will use the money earned to restock their shelves. If you can make it, we’ll send you a list of items we need donated to create the crafts. There is no pressure to bring any items with you, but if you are able to purchase or have some of the materials lying around at home, that would be great! If you have a talent you would like to share, any talent….. sing, play an instrument, read a poem, juggle, tell jokes, act out a short skit, perform a monologue… anything, we would love your help!! We will be putting on a short talent show for the residents at Kent Ridge. The seniors at the center are so appreciative of entertainment and interaction with young people. After the show, we will pass out cider and cookies and talk with everyone there. It is sure to be a heartfelt experience!! If you are interested in this event, please let me know asap because we need to be sure we have enough people to perform :). We will plan to finish up any last minute preparations for the craft show and then work on sewing pillow cases to go with the no sew fleece blankets we already made to donate to SOS for Christmas. If you plan to join us, we’ll send you pictures of the completed blankets, and if you are able to bring coordinating material to make one pillowcase, we can give you the dimensions, if not – that’s ok too :). Let us know if you would like to help sell items during the craft show. We will have shifts set up, so that you may pick the time that works best for you. We will also need assistance with set up and clean up. We had so much fun at the show two years ago!! We are excited to help prepare Thanksgiving dinner for SOS again this year. If you are able to donate any food items, please let us know. We will have a list of items needed and can use all the cooking help we can get! We will be gathering for our third annual Christmas wrapping party for Miller Community House in Kent. We are waiting to hear back about which date will work best for Miller House and then we will update this page. Join us in making Christmas cookies in hope of bringing the teens at SOS some holiday cheer. We will put together 25 plates. Some of the cookies we’ll make together, but because it will be impossible to make enough baked goods in two hours, each volunteer is asked to bring at least two dozen (if possible) treats to add. We will meet at my house and then drive to Akron to the bridge on Market St. to hang hats, scarves and gloves again this year. It was cold last year, but we were able to provide warmth to so many people! After we’re finished, we’ll have lunch together at an area restaurant before heading back to Kent. We ask that everyone collect donations of gloves, hats and scarves from now until Jan. There are some great buys at the Dollar Store and in Target’s dollar section. Target also has packs of gloves for under $5 in their regular section too, as does Walmart. Ask your friends and relatives if they have any gently used items. Last year the grandmother of one of the girls in our group asked her knitting group to knit hats. They came out beautifully! My mom and I also knitted and crocheted hats and scarves as well. Other volunteers made no sew warm fleece hats and scarves too. We had a great variety of items to hang. Gather at my house for donuts and hot chocolate while we write letters to service men and women. We’ll provide the cards (handmade by my grandmother :). Last year we packed sack lunches for SOS and they were greatly appreciated, so we’re making them again this year for Freedom House in Kent. We will put together 28 bags of food. A donation list will be provided for anyone able to bring contributions to the project. “Freedom House exists to provide emergency shelter to those veterans in a housing crisis, while also providing support, advocacy and referrals to encourage self-sufficiency and movement towards permanent housing”. In researching different charities to support, I found Preemies of the Carolinas. This organization provides hats, blankets and so much more to babies born prematurely. The organization needs volunteers to make developmental (inspirational) hearts. 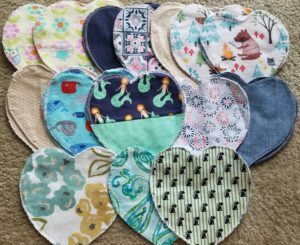 “Two Inspirational Hearts are given to mothers whose newborn infants have been admitted to the Newborn Intensive Care Unit. One flannel heart is worn against the mother’s skin, so that the fabric absorbs her scent. The second heart is placed with the baby in the crib to absorb his/her scent. 24 hours later, the hearts are exchanged so that the mother and child have each other’s scent with them, even when they have to be apart. Each set of hearts comes with a poem”. Once again, please let us know ahead of time if you can join us, so that we make sure we have enough material for everyone. If you are able to bring two yards of coordinating flannel, that would be great -one plain yard for the back and one patterned yard for the front. Mobile Meals asks for handmade decorative placemats to spread some cheer when they deliver meals to their housebound clients. We will make a variety of placemats to drop off for distribution. If anyone has some design ideas, I would love suggestions. Volunteering for Open Arms Adoption, “a private, 501(c)3 non-profit agency licensed by the State of Ohio. The agency was founded on the belief that every child deserves a family.” Our efforts will be geared toward helping the staff prepare for their golf outing fundraiser on 6/14. Join us in preparing 28 breakfast bags for Freedom House in Kent. “Freedom House exists to provide emergency shelter to those veterans in a housing crisis, while also providing support, advocacy and referrals to encourage self-sufficiency and movement towards permanent housing.” A donation list will be provided for anyone able to bring contributions to the project. We are working on a few ideas for our last get together before school starts. I’ll update the site as soon as we have firm plans.